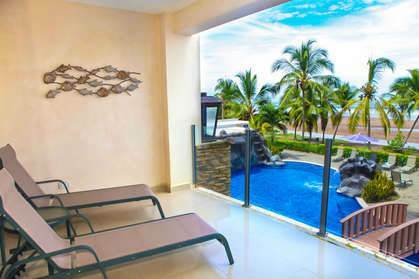 Located directly in the heart of downtown Jacó, Diamante Del Sol is one of the most upscale beachfront communities in town. Its modern design and unobstructed view of the Pacific Ocean make it a popular choice for many. Its central location adds to the allure as everything in Jacó is within walking distance. This 2nd floor unit with 2bd / 2.5 baths has contemporary design and finishes. Exquisite kitchen with top of the line appliances, custom cabintry and granite countertops. Being sold fully furnished & turn key.